Wine aerators work. I’m not sure what mix of science and magic make it so, but across the board everyone I’ve done taste tests with has bought one. This guy is my recommendation. 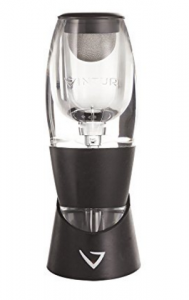 I like the fact it’s not attached to the bottle cause I’ve actually had someone throw out an empty bottle with an aerator on it after a lengthy testing session, plus it makes a cool noise and I like watching the wine swirl through it.